I have always loved to draw and I find inspiration in almost everything around me. I visualize things mentally with little effort (usually) and can put pencil to paper and sketch out a rough rendering. With time and effort, I can make a design more defined. Then I scan my drawing into Glass Eye 2000, clean it up, and add the glass. If my sketch is rough, I will sometimes first scan the image into Photoshop, zoom it by 500%, and use the eraser tool to smooth out the lines and to make the image a clean line-art pattern. This is because my pencil drawings often show "noise" around the intended lines and the AutoTrace function in Glass Eye 2000 sometimes interprets those as design lines. I also make certain my line intersections are clearly delineated to help Glass Eye 2000 identify them. The next step is to add the image as a background into Glass Eye 2000. I often adjust brightness and contrast to make sure the image comes through clearly. Then in the AutoTrace function, I will use options like speck removal and image softening, especially if I didn't clean up the image manually in Photoshop. Once I am satisfied with the image in the preview pane, I let the AutoTrace command turn my background image into a line drawing. Next, I drag the traced lines as a group away from the background. Now I can continue to work on my design by adjusting the positions of the lines, adding new lines, or deleting lines I don't want. Often I zoom in so that I'm working on my design at larger than actual size. After completing my final design changes, the real fun begins: I get to experiment with coloring. Fairies are portrayed so many different ways. Some are imps and some are more like butterflies, but almost always very brightly colored. 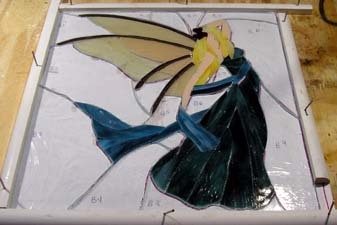 In my design I wanted to capture the maturity and desire within the fairy. So I went with a more formal coloring scheme — one that was inspired by shopping for wedding dresses and bridesmaid gowns with my daughter. After all, doesn't every bride appear angelic or fairy-like? Adding the background and the radiating lines to the design was simple once I determined the size of the piece I wanted to make and the overall shape I wanted it to be. I used the Square command to create a border for this piece. Then, to make the radiating lines connect to the frame I simply dragged the ends of the lines to where I wanted them to connect. The "feel" of the project is something that comes with practice, but Glass Eye 2000 allows for a lot of experimentation and creativity. Have fun… that's my motto! Donna Mixon works from home with her husband Terry. She has a Bachelor's and Master's of Business Administration from Baylor University in Waco, Texas and has worked for over 20 years in the accounting industry. Donna is currently disabled with Myasthenia Gravis and fibromyalgia. 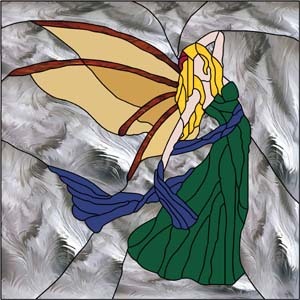 Donna and Terry have been working in stained glass for a little over two years, and have an art division called Fuzzy Designs within Mixon Enterprises. 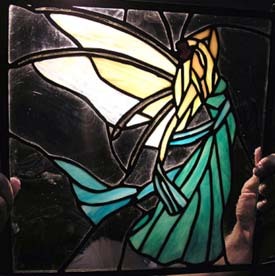 While relatively new to stained glass, it has been a lifelong passion. They also own and operate eKnifeShop, selling swords, knives and collectibles.